Information and Referral is the art, science and practice of bringing people and services together and is an integral component of the health and human services sector. People in search of critical services such as shelter, financial assistance, food, jobs, or mental health support often do not know where to begin to get help, or they get overwhelmed trying to find what they need. I&R services recognize that when people in need are more easily connected to the services that will help them, thanks to knowledgeable I&R professionals, it reduces frustration and ensures that people reach the proper services quickly and efficiently. The people who work these lines are consummate professionals who are often times like living, breathing encyclopedias; providing answers to questions ranging from, “Where can I get a free meal for my family” to “There’s a horse running loose in my neighborhood, who do I call?” We at iCarol are really honored to have so many Information and Referral services all across the world use our software to help provide these services to people who reach them via phone, chat, or text. If you’d like to learn more about what iCarol does to support efficient referral management, check out this page of our website that goes over some of those features. You’re also welcome to join one of our regular webinars that focuses solely on our Information and Referral tools. We hope you’ll join us sometime to learn more. Happy I & R Day, everyone, and kudos on the awesome work you do connecting people with the services they need! It debuted on HBO nearly two years ago but the stories of struggling families in the documentary film “American Winter” still resonate. In case you missed it, this documentary is still worth checking out even though we are now several years past the economic depression that inspired it. The film covers the stories of a diverse set of families in the Portland, Oregan area, all going through their own financial crises. What’s unique about this film, and of special interest to those in the helpline industry, is that the film incorporates the local 2-1-1 service into the storytelling. It’s an eye-opening view (especially to those unfamiliar with 2-1-1) of the services, support, and knowledge that 2-1-1 provides to those seeking assistance with basic human needs. So many people were helped by the information and referral specialists of 2-1-1 centers all over the US and Canada during those tough times. It’s wonderful to see a documentary highlight the service and the very real ways these families were assisted, and reminds us that people continue to need those services today. So if you haven’t watched the film, check out the trailer (below) and consider watching the documentary streaming via HBO Go, or by purchasing the DVD. It’s a heartbreaking look at the reality of economic inequality and a dark time in our history, but you’ll feel proud of the hard work the helpline industry is doing to make a positive impact. On Thursday July 17, 2014 at 2:30pm EST, the Alliance of Information and Referral Systems (AIRS) will present a Webinar on predicting tornadoes at the storm prediction center. This webinar aims to provide useful information for your helpline operations in times of disaster. There are tons of great webinars, training opportunities, and other professional development opportunities presented by AIRS that are only available to members. Want to become a member of AIRS and take advantage of all the great perks of membership? Find out how. Recently Vinh and I attended the Alliance of Information and Referral Systems annual conference in Atlanta, GA. As always it was a great crowd and we had fun seeing so many friendly faces, catching up with our friends, clients, and colleagues, and hearing about what everyone’s been up to. 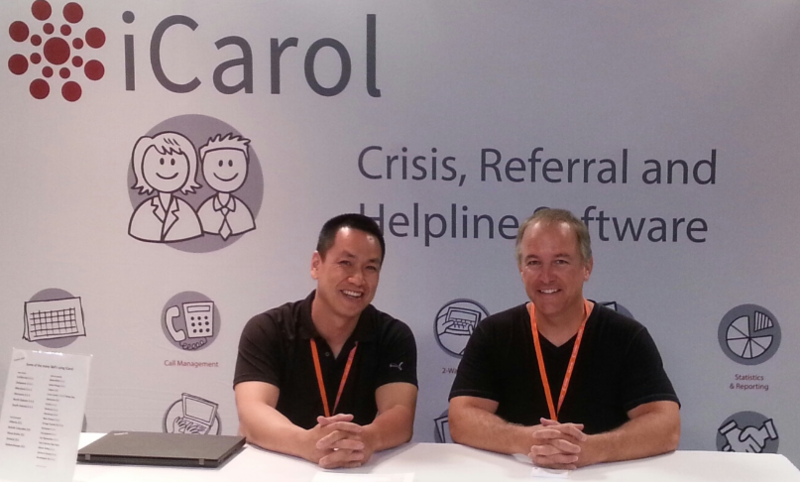 Here we are at our booth, waiting to tell everyone in the exhibitor’s hall all about iCarol Helpline Software. 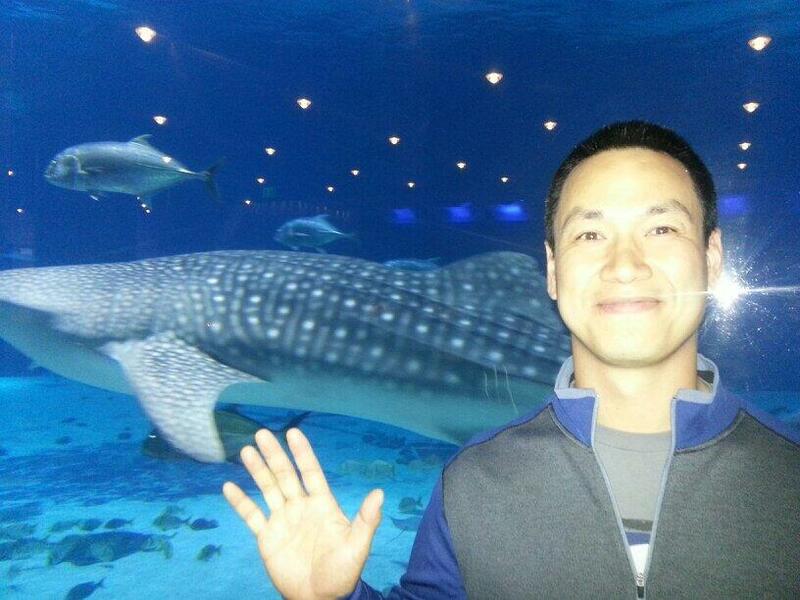 A true highlight was the reception on Monday night, held at the Georgia Aquarium, an amazing and beautiful place. If you visit the Atlanta area it’s a great attraction to check out. 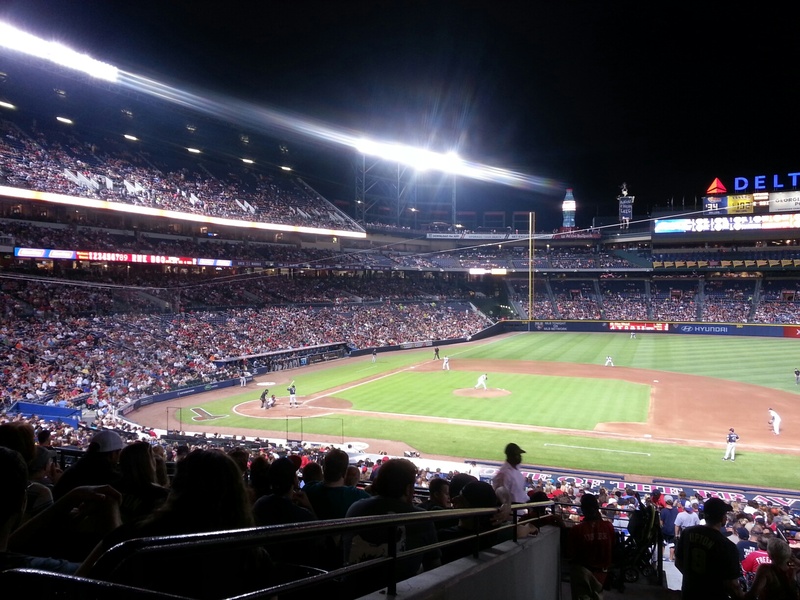 On Tuesday night we had a great time with some folks at the Atlanta Braves game, though unfortunately the home team lost against the Mariners 5-7. And of course, there were lots of great presentations and exhibits to check out at the conference. We enjoyed 211 Ontario’s presentation on Service Delivery from the Community up. With 7 call centers, 36 data providers, and 500,000 calls per year, it’s quite an impressive group that we’re proud to be associated with. There’s a lot of discussion about “Open Data” with various initiatives underway, and iCarol is involved in all the discussions and brainstorming on that topic. We’ll have more to share about this topic and our involvement in the coming weeks. California 211 presented information on the Kinship Navigator project which utilizes the iCarol API. In short, people search the Kinship Navigator system on the iFoster server, which is totally separate from and unrelated to iCarol. When a user searches the iFoster server on that website, it realizes there’s information in the participating iCarol systems that may fit that person’s search, and so with the details and nuances existing via the iCarol API, iFoster servers reach out via iCarol API to the four different participating iCarol systems and collects appropriate and authorized resources, then sends them back to the iFoster system for the person searching that website. This all happens seamlessly and in a matter of seconds. To hear a little more about this you can check out our recent webinar on iCarol’s Resource Tools (skip to the 36:10 minute mark if you want to hear specifically about this project). The technical ins and outs of understanding how an API works can be daunting, and so there were lots of questions. One audience member posed the analogy, “So is an API sort of like when a cashier at the front desk hollers back to the store room to bring them a can of beans, and the stock boy brings it to the cashier who then sells it to the customer?” And yes, that’s a great analogy! The Orange County 211 presentation on their public website revisions was fantastic. With just a few small tweaks in how they use iCarol’s Public Resource Directory, including the addition of Folksonomy, they increased their website traffic by 108% in two months, with no changes in their marketing at all. And finally a workshop on Resource Database Assembly: The Next Generation, presented a very interesting notion on Resource Complexity. It was so inspiring that it’s going to result in a new feature to iCarol, more details on that soon! AIRS put on a really great conference this year, and in case you’re interested they’re making a collection of photos from the conference publicly available here. Thanks to everyone who stopped by our booth to say hi, and of course to the new friends we made if you want to learn more about iCarol we’d love to hear from you. Give us a call, or join an upcoming webinar to learn more about us and our features. iCarol has many tools to use when searching for resources. Using these tools, call takers can fine tune their searches in order to find the most appropriate resources for your clients. Please read on to learn about these tools and how to use them. There are three search types in iCarol – Taxonomy, Resources and Keywords. Taxonomy refers to the AIRS Taxonomy, used by 211 agencies in Canada and the United States. This is a 7 level categorization hierarchy that is used to categorize human service agencies into over 9,000 categories. Resources is used to search your resource database for the name of the agency or program. Keywords refer to a categorization system that you can set up yourself. Placing your resources into categories can help your call takers narrow their searches quickly to find, for example, Domestic Violence resources or Individual Counseling resources. There are several filters you can apply to your searches on top of the search type. Names should be used when you want to search by the name of the agency or program. 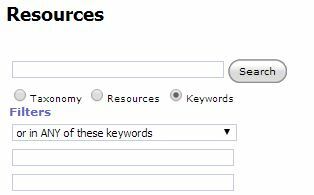 Please note that searching Resources actually searches three different text fields in your resource records – Name, Alternate Name and Search hints. In this way, you can search for the Salvation Army by its official name, Salvation Army, its alternate name, Sally Ann, or a term that is placed in the search hints, perhaps the name of the building the agency is housed in, the Hope Center. All fields can be used to search other text fields in the resource record besides Name, Alternate Name and Search hints, such as the Description field. This can be helpful if you are searching for a term that is not likely to be found in a name. For example, perhaps the client needs help obtaining diapers. It is very unlikely that there is a resource name in your database with the word diapers, but that word may appear in a Description field where the services the agency or program offers are outlined. Specific field, with the associated drop-down menu, can be used to conduct a search in a very specific text field, such as address or eligibility. Agencies, Programs, Sites or ProgramAtSite will appear for those using the three or four level resource hierarchy available in iCarol. In this way, the call taker can limit their searches to just certain record types. Best practices indicate that the majority of searches should be conducted at the program level. Include Inactive and Include Active but do not refer refers to the status of the resource records. These filters can be used to search records of all statuses, not just the active resources. 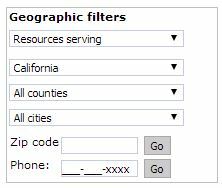 These filters can be used to narrow searches by their proximity to the client or the coverage area the resource serves. Resources within means that iCarol will search for resources that are physically located within the geographic area indicated by the country, state/province, county, city and postal/zip code filters entered. iCarol bases this search on the physical address entered into the resource record. Resources serving means that iCarol will search the coverage area of each resource and return those that meet the geographic area indicated by the country, state/province, county, city and postal/zip code filters entered. iCarol bases this search on the coverage area field in the resource record. Combining the filters above when conducting resource searches can result in a smaller, targeted list of results that is much more manageable for the call taker to look through. This saves time and increases the likelihood that the client receives the most appropriate resources to meet their needs. On Monday March 24, 2014 at 4pm EST, the Alliance of Information and Referral Systems (AIRS) will present a Webinar on Family Crisis Centers in Time of Disaster. It’s February 11th and today we celebrate 211 Day. 211 is an easy to remember three digit number, but unlike 411 or 911, the focus of 211 is to provide callers with information and referral to health and human services in their communities. Best of all it’s free* and confidential. Boasting an impressive reach, 211 is available to nearly 91% of Americans and 56% of Canadians. In the US 211 has a presence in all 50 states, the District of Columbia, and Puerto Rico. 211 is the number to dial when you need to know what local service might help you prevent an eviction, apply for food stamps, seek treatment for mental illness or addictions, or avoid a utility shut off due to an unpaid bill. Rather than spend hours of frustration calling around to various agencies, callers can make 211 their first call for assistance and speak to a trained Information and Referral Specialist that can spend time evaluating their needs, educating them about resources, and then connect them with the appropriate services. 211 is also an essential service in times of disaster. 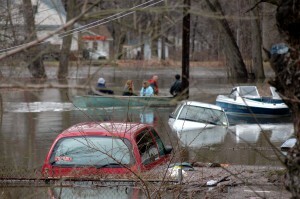 In recent years during hurricanes, blizzards, flooding, earthquakes, and other natural disasters, 211 is widely known as a number to call for information and referral. Even in the more routine, yet still disruptive, events such as extreme cold or heat, 211 is available to refer callers to heating or cooling centers. Winter can be especially hard for people with financial hardships as utility cut offs can pose a real danger. In times like these 211 helps direct callers to local services that assist with utility bills, sign up for energy assistance, or prevent a shut off. iCarol is delighted and honored to work with so many 211 providers across the US and Canada. These organizations provide a vital service to their communities and connect millions of people to essential services each year. How is iCarol better than Google for Information and Referral software? Let me count the ways. Would you want police officers driving their personal vehicles for their work? Doctors performing surgery in a spare bedroom at their house, using utensils from their kitchen? Teachers writing their own textbooks? Librarians arranging books by their personal tastes? No – and for similar reasons you want call specialists to make referrals to service providers based on the standards and tools honed by professionals for decades, nation-wide. Here are some reasons why Information and Referral software like iCarol is better than using a public search engine like Google, and also why those search engines are poorly suited for professional work. 1. Well-structured resource records and fields that have been tuned for information and referral work – when a call specialist is looking at a record, they know exactly where to find relevant information about a service, like service description, eligibility, contact information, hours of operation, etc. 2. Search algorithms under your control – yielding predictable, repeatable search results based on factors highly tuned for doing information and referral work, not on factors that are best for generating advertising revenue or that favor entities who happen to have done a good job of search engine optimization. 3. Geographic service areas – limit search results to just those that serve the client location, and then also sorted by proximity to that location. Otherwise you risk sending a client to a service for which they are not eligible. 4. Precise categorization of services, with the 2-1-1 Taxonomy or another well-structured category scheme – So for example when you are looking for a “Food pantry”, that term is well defined, sits in a rational place in the taxonomy (so it can be found) and will yield all services available in your community that meet the definition. With over 9,500 such taxonomy terms in a well-structured six-level hierarchy, call specialists can find the right services with high accuracy. 5. Find related services relevant to the caller – recommends other services that might be useful to the caller, based on referrals made to callers in the past and/or services that are often referred to together. 6. Annual validation of data – Confidence that the information you are providing is up-to-date and correct in the recent past. 7. 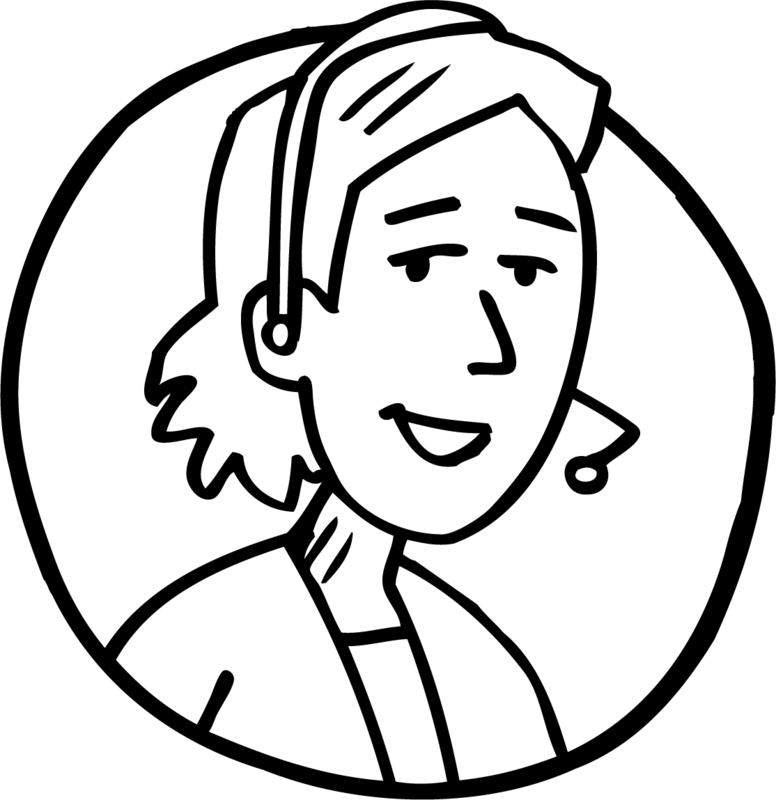 Adherence to your Inclusion Policies – Ensure that incorrect, illegitimate, illegal or immoral resources are not referred to by your call specialists. 8. Consistent and professional results – For two callers with the same needs and locations but served by different call specialists, they would get the same referrals, as they should. 1. Human services are in the business of, well, serving humans. They are not in the business of optimizing their website for high rankings in search engines. Many valuable services do not even have websites. Relying on Google to find and rank searches would inevitably miss countless important services in your community. 2. Websites get outdated leading to incorrect service information. 3. Services go defunct, even if the websites are still available. 4. Even if correct, website formats, layout and content are vastly different from service to service, leading call specialists to spend undue time trying to figure out if they offer services a) meeting the clients needs b) that the client is eligible for and c) that is near the client. 5. Google changes its search algorithm frequently to suit their needs and the needs of their advertisers, often in very controversial but opaque ways. 6. The terms a call specialist might search for would be of course highly subjective, which would yield different results even for callers with identical needs.